Day 10: Humor | Awakenings! Humor is my key to sanity. Most would find that sort of humor vulgar so shortly after his passing but what else could I do? I was devastated by the loss but my husband also had a wicked, almost sick sense of humor that I absolutely loved. He would have been proud that I was cracking jokes about his death. She was hardly amused. The serious look turned into a scowl. She’s the type that almost looks for ways to be offended so I shouldn’t have been surprised. As it turned out she came by to tell me what’s wrong with me and what I need to do to change my issues. Isn’t that lovely? Shemar Moore (Criminal Minds) would be my son. This week, my son is on a roll telling me really good lawyer jokes. His father would be so proud. The one that got my attention this morning: What do lawyers say before they take a picture? Fees. Laughter is the best medicine and for some reason after I left home for good, my ability to be funny came naturally. It helps to have cousins with an impeccable sense of humor but I’m now realizing it’s because I’m more at peace, ease with myself; hence, I am more able to laugh at myself and the irony of my circumstances. Consequently, I have a much lighter heart. Thank you Lord for humor. What an awesome blessing. 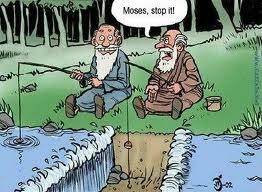 I saw that Moses comic strip a few months ago and was immediately reminded of Bruce Almighty. You remember that scene where Bruce parts the tomato soup? I’ll be looking like Beyonce when I get to Heaven. If it happens before, then you know there is a God fo sho! I’m glad that you are using humor to help yourself get over the grief. Great that you are easing back into life after the lost. I’ve learned I don’t like grief, depression or PTSD. I’m truly grateful the fog is finally lifting. The fog felt more like Stephen King’s fog but “The Son will come out tomorrow …” I’m eager to get on with my life. So much to see, do, accomplish before I move on to Heaven. You made me smile. I am amazed by you woman. I don’t know if I could find my way. I am glad that you are OK and find comfort in humor 🙂 Thank you Lord for Humor! Amen to that & I love your family casting! I’m so glad this post made you smile. Mission accomplished. It’s almost incredible how you’re able to find humor in the midst of misery. I like that :). I wish I was like that. Oh, I love Miranda Cosgrove by the way. That’s a perfect cast for your own TV show :). I used to be able to find humor in everything. Believe it or not, the only thing I can’t find humor in is 9/11. Beyond that, there’s lemonade everywhere. I am happy for you that you are able to laugh through your pain. And my what a beautiful tv family you have. Can I go on a date with your son?